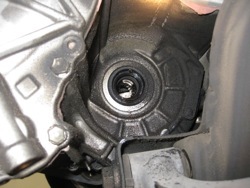 One of the few common problems with the Gen 2 Prius (MY 2004-2009) is a leaking output shaft seal from the transaxle, always driver’s side. We’ve seen it on Gen 1 Prius as well, but less frequently. 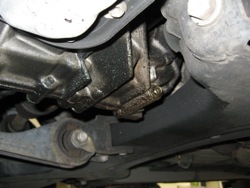 It’s not the end of the world, but there’s no question it should be fixed, since the car seldom leaks otherwise. When the axle comes out (to access the seal) so too does transmission fluid, so we just include a transmission fluid flush with the service. Since we recommend transmission fluid changes every 30k for all Series/Parallel hybrids (Toyota, Ford, Nissan), we can usually time the seal replacement with a 30k service to stay on track with maintenance intervals.